News of politician Vladimir Putin’s death spread quickly earlier this week causing concern among fans across the world. However the March 2015 report has now been confirmed as a complete hoax and just the latest in a string of fake celebrity death reports. Thankfully, the Russian president is alive and well. Hundreds of fans immediately started writing their messages of condolence on the Facebook page, expressing their sadness that the talented 62-year-old politician and president was dead. And as usual, Twittersphere was frenzied over the death hoax. Where as some trusting fans believed the post, others were immediately skeptical of the report, perhaps learning their lesson from the huge amount of fake death reports emerging about celebrities over recent months. Some pointed out that the news had not been carried on any major Russian network, indicating that it was a fake report, as the death of a politician of Vladimir Putin’s stature would be major news across networks. A recent poll conducted for the Celebrity Post shows that a large majority (67%) of respondents think those Vladimir Putin death rumors are not funny anymore. On Monday (March 02) the politician’s reps officially confirmed that Vladimir Putin is not dead. “He joins the long list of celebrities who have been victimized by this hoax. He’s still alive and well, stop believing what you see on the Internet,” they said. Some fans have expressed anger at the fake report saying it was reckless, distressing and hurtful to fans of the much loved politician. Others say this shows his extreme popularity across the globe. The following document was obtained from a website associated with the Regional Information Sharing Systems Program. (U//LES) Humming bird and Marilyn Monroe tattoos may have a nexus to the Mexican Mafia, while “G Shields” (Aztec warrior shields) and mariposas (butterflies) may be decreasing in popularity. 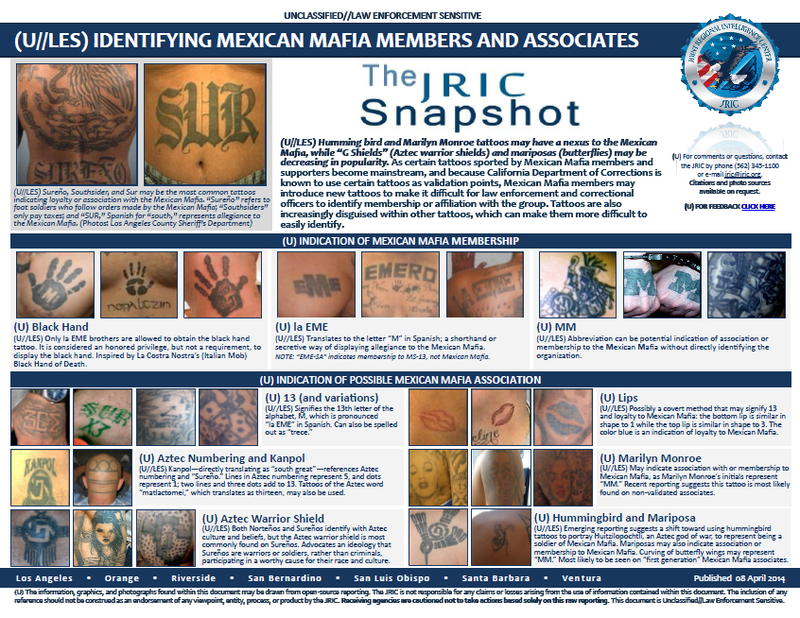 As certain tattoos sported by Mexican Mafia members and supporters become mainstream, and because California Department of Corrections is known to use certain tattoos as validation points, Mexican Mafia members may introduce new tattoos to make it difficult for law enforcement and correctional officers to identify membership or affiliation with the group. Tattoos are also increasingly disguised within other tattoos, which can make them more difficult to easily identify. (U//LES) Only la EME brothers are allowed to obtain the black hand tattoo. It is considered an honored privilege, but not a requirement, to display the black hand. Inspired by La Costra Nostra’s (Italian Mob) Black Hand of Death. (U//LES) Translates to the letter “M” in Spanish; a shorthand or secretive way of displaying allegiance to the Mexican Mafia. NOTE: “EME-SA” indicates membership to MS-13, not Mexican Mafia. (U//LES) Abbreviation can be potential indication of association or membership to the Mexican Mafia without directly identifying the organization. (U//LES) Kanpol—directly translating as “south great”—references Aztec numbering and “Sureño.” Lines in Aztec numbering represent 5, and dots represent 1; two lines and three dots add to 13. Tattoos of the Aztec word “matlactomei,” which translates as thirteen, may also be used. (U//LES) Both Norteños and Sureños identify with Aztec culture and beliefs, but the Aztec warrior shield is most commonly found on Sureños. Advocates an ideology that Sureños are warriors or soldiers, rather than criminals, participating in a worthy cause for their race and culture. (U//LES) Possibly a covert method that may signify 13 and loyalty to Mexican Mafia: the bottom lip is similar in shape to 1 while the top lip is similar in shape to 3. The color blue is an indication of loyalty to Mexican Mafia. (U//LES) May indicate association with or membership to Mexican Mafia, as Marilyn Monroe’s initials represent “MM.” Recent reporting suggests this tattoo is most likely found on non-validated associates. (U//LES) Emerging reporting suggests a shift toward using hummingbird tattoos to portray Huitzilopochtli, an Aztec god of war, to represent being a soldier of Mexican Mafia. Mariposas may also indicate association or membership to Mexican Mafia. Curving of butterfly wings may represent “MM.” Most likely to be seen on “first generation” Mexican Mafia associates. Film – All you ever wanted to know about Russian Gangsters.